Thanksgiving is the pinnacle of family gatherings. It’s the time of year when family travels to be together, share a meal, and make memories. It’s also a time to share memories of past holidays and reminisce about those who are no longer with us. No matter who will be gathering in your home, immediate family or all the cousins, there is a need to prepare your home for Thanksgiving. Cleaning, meal prep and decorating are just a few items at the top of everyone’s list. 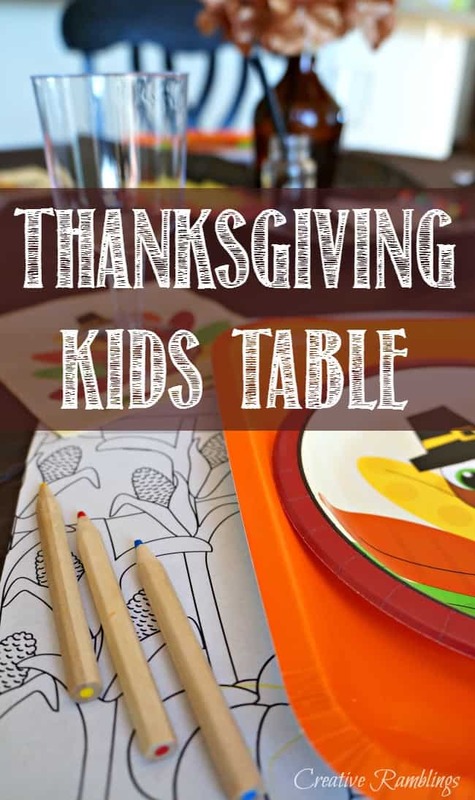 I am sharing go-to products that will help you prep for the holiday and clean up afterwards because, let’s face it, “when families gather, things get messy™”. 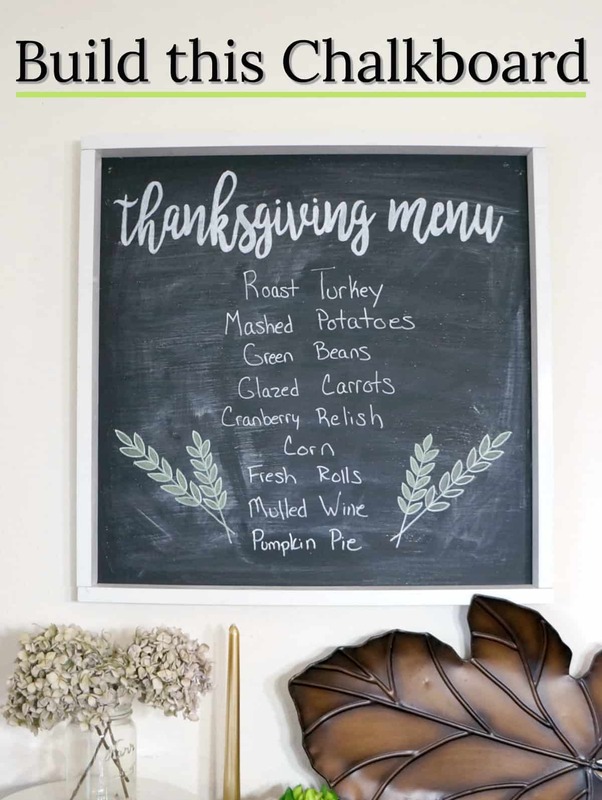 I also have an easy DIY chalkboard for you that makes a stunning Thanksgiving menu board. As the years move by, the family that surrounds me on Thanksgiving changes. I have said goodbye to Grandparents, Aunts, and Uncles and welcomed children, nieces, and nephews to my table. I love making new memories with the younger generation and sharing photos and stories of Thanksgiving from my childhood. This holiday is one of my absolute favorites. As much as I love Thanksgiving I have learned, to avoid undue stress, to leave lots of time for preparations and not leave things until the last minute. Cleaning my home is always the biggest task, I want my guests to feel welcome, a dirty bathroom and sticky table just won’t cut it. 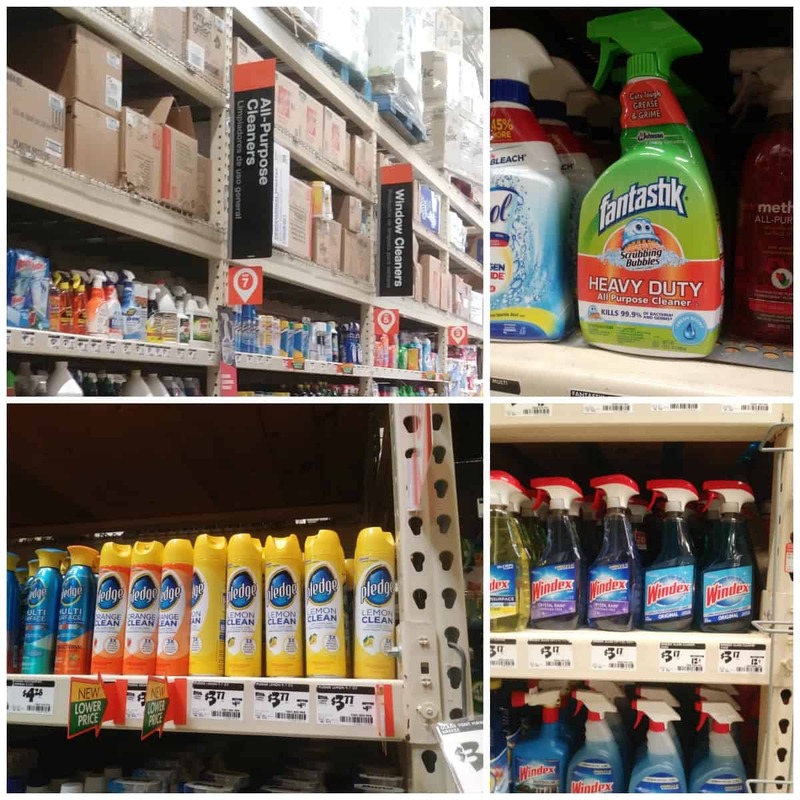 I picked up a few cleaning products from Home Depot to help prepare my home for Thanksgiving. 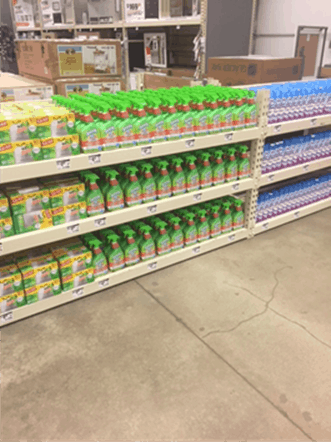 Be on the lookout for Pledge® product promotions on display in Home Depot stores 11/1/17 through 1/31/18! I start cleaning my rooms about a week before and finish up with my bathrooms the night before everyone arrives. Starting with the dining room I use Pledge® Lemon Clean to polish and shine my wood dining table and buffet. 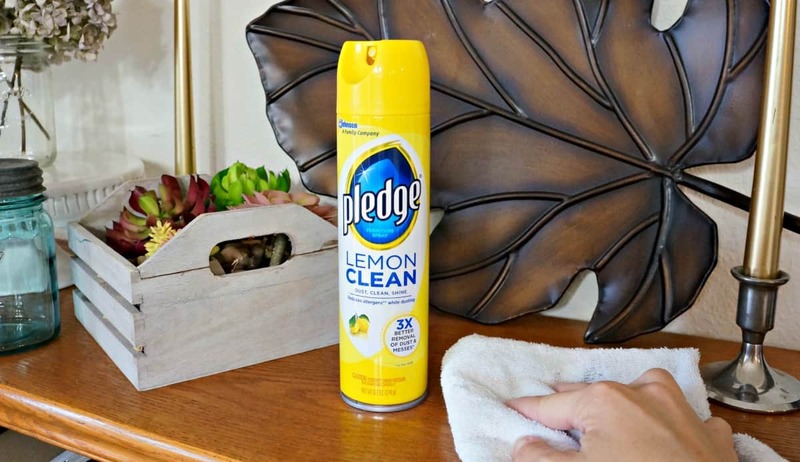 It cleans and protects a variety of hard surfaces while leaving behind that classic, fresh lemon Pledge® scent. 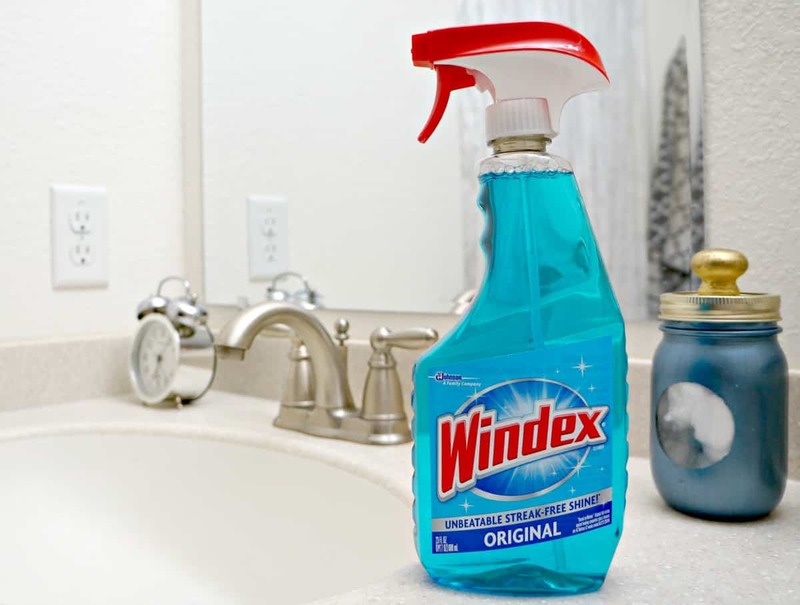 Moving onto the bathrooms I use Windex® Original Glass Cleaner on my glass, mirrors and counters. Trusted for generations Windex® starts working on dirt even before you wipe. Scrubbing Bubbles® Fantastik® is a powerful antibacterial solution that cuts to the center of grease and grime and dissolves it on contact. 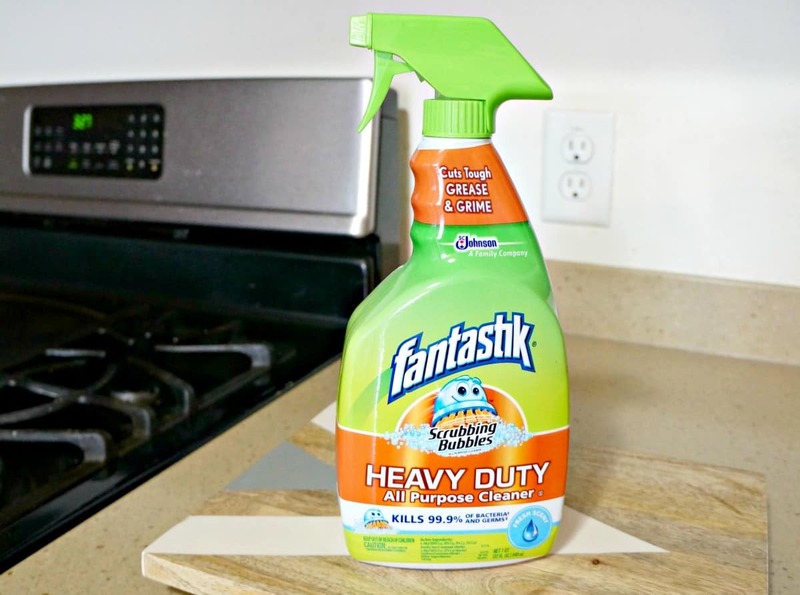 I use this in my kitchen to clean my stove and other appliances, as well as the hard surfaces in the kitchen. I love that it’s a no rinse formula so I don’t have to spend as much time cleaning. A few weeks prior is the perfect time to decorate for Thanksgiving. 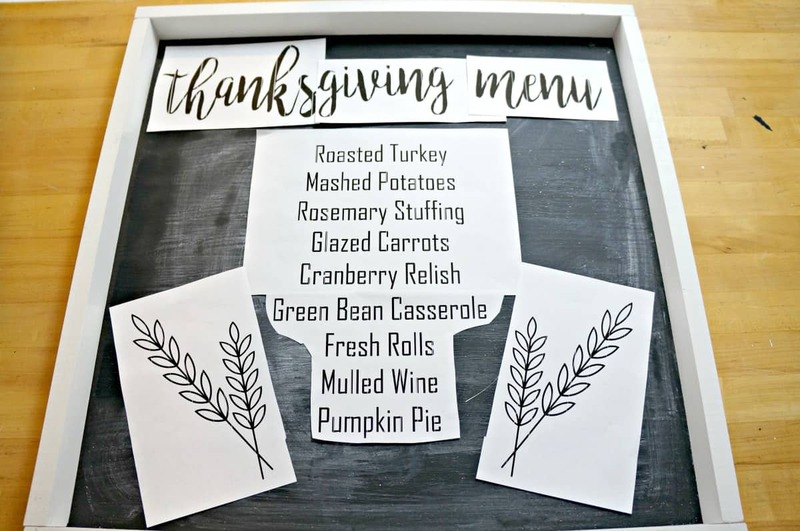 I made a DIY chalkboard using supplies from The Home Depot to hang in my dining area and display our Thanksgiving menu. I love that after our meal I can erase this menu and display a quote, message, or cute drawing. Take a look at this video and learn how to make your own. 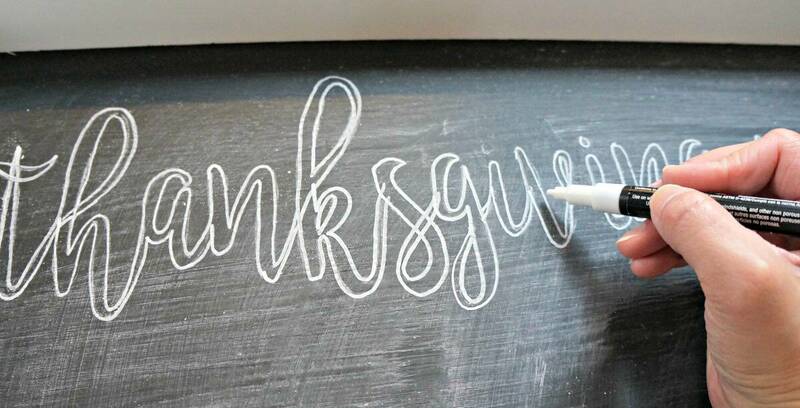 This lightweight DIY chalkboard can be used for the Thanksgiving menu. Here is how to add professional looking lettering. First design your menu using a design software or word processing software. 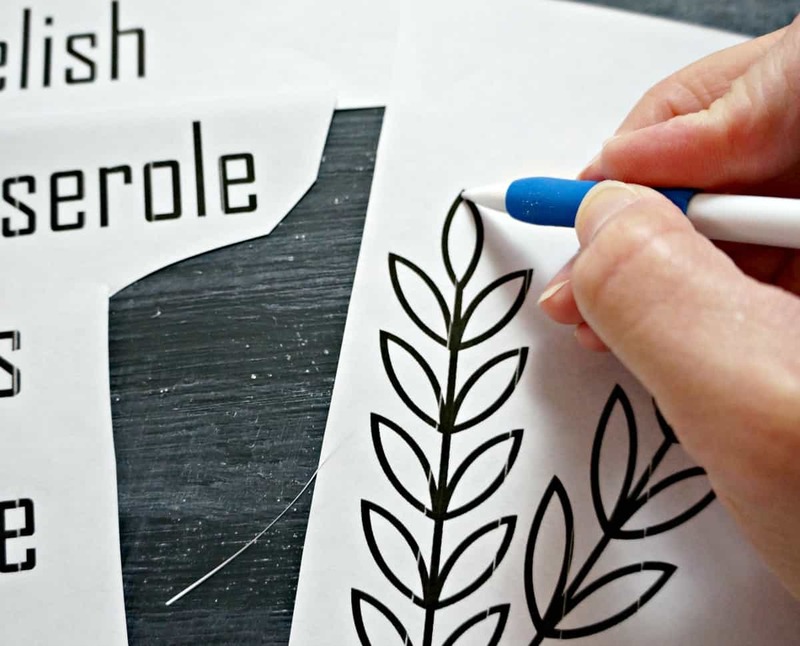 Then print your words and graphics onto plain white copy paper, cut out the pieces and arrange them on the chalkboard. 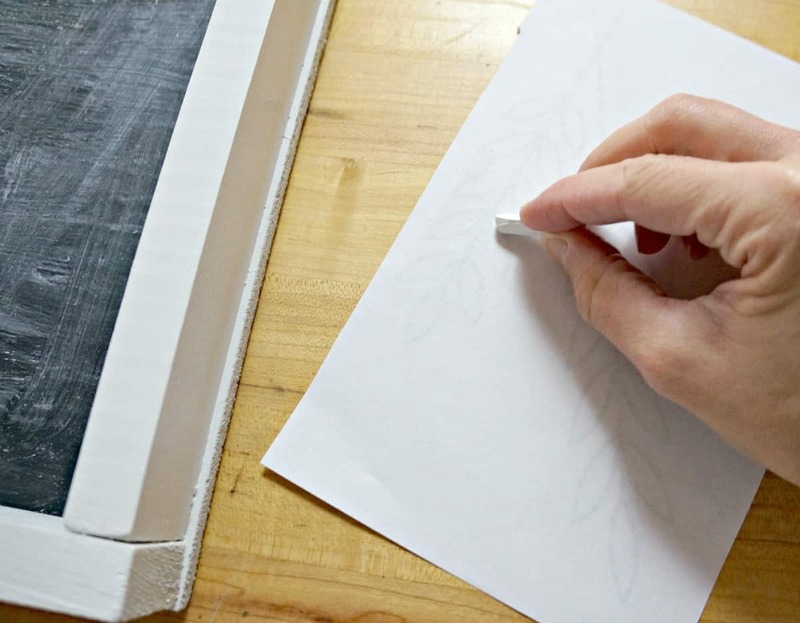 Then cover the back of each piece of paper with white chalk, just color over the whole piece. Then place the paper chalk side down on the chalkboard and trace each line with a dull pencil, I use a mechanical pencil without any led. This leaves a chalk line of your design on the chalkboard. 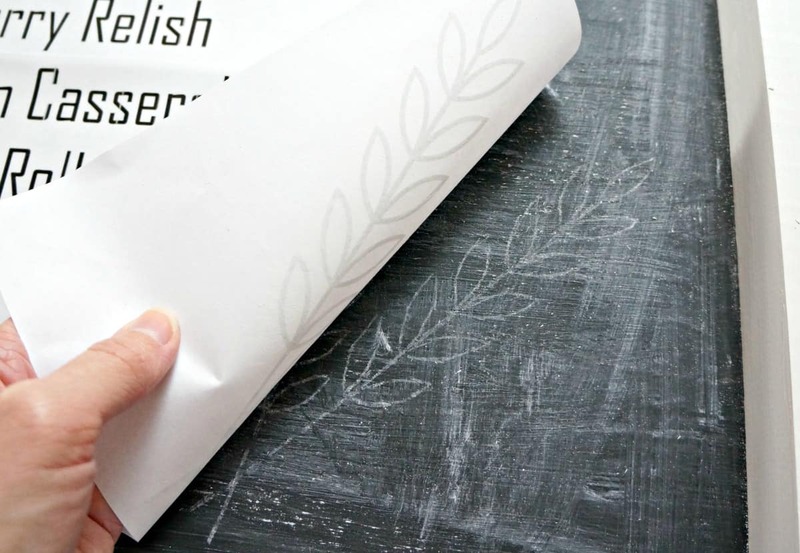 Once all the letters are traced, go over them with chalk markers to make your menu pop. I am so looking forward to celebrating and sharing a meal with those I love this year. Looking at my menu already I am remembering the first time I made cranberry relish with my Mom and mashing potatoes with my Grandma when I was little. This year there will be little feet in my kitchen and I get to make memories with my girls and their cousins that will stick with them for a lifetime. 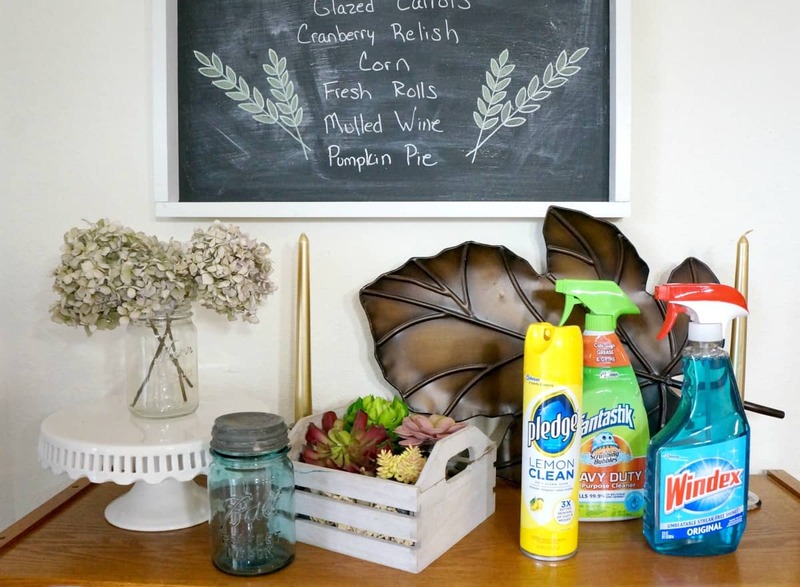 A sparkling clean home and this DIY chalkboard will help you prepare your home for Thanksgiving and welcome your guests. Take a deep breath and remember when families gather, things get messy™. Enjoy the holiday and get more cleaning inspiration here. I’d love to hear a special Thanksgiving memory you have or something you are looking forward to this year. Love the chalkboard and all the cleaning products too. They are some of my go-to products! that chalkboard is so cute! and I definitely need to get ready! !